A 51 y.o. 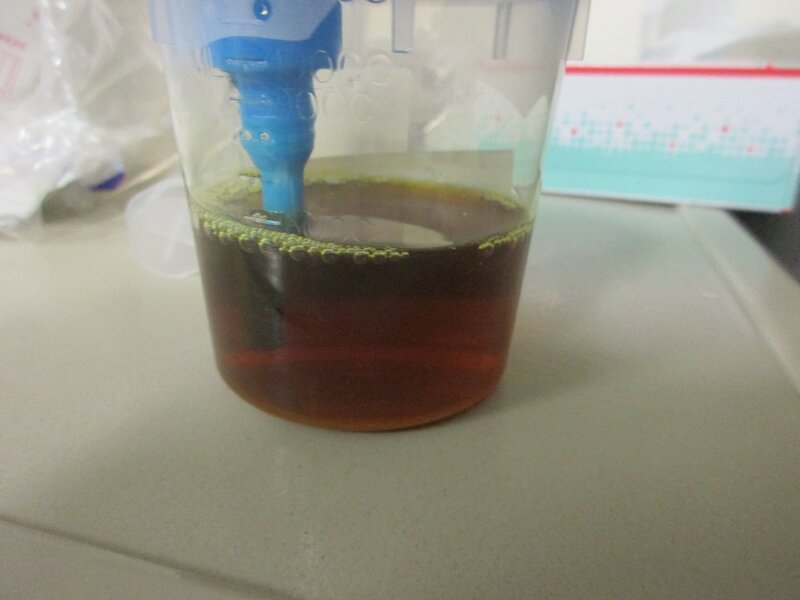 man comes in after being treated for bronchitis with the urine shown below. Our patient had received augmentin for his bronchitis. Augmentin is the most frequent cause of idiosyncratic drug-induced injury in the US. Augmentin causes a moderately severe mixed hepatocellular-cholestatic injury, particularly in older men. In a study from 2016by deLemos et al, of 117 patients reviewed only 3 required liver transplants. The mean time to injury was 31 days and average time to return to normal was 55 days. Levels of bilirubin in the blood greater than 3 results in jaundice. Jaundice is from the French jaunisse, meaning “yellow disease”. Elevated bilirubin results in yellowing of the whites of the eyes which is termed scleral icterus although it is actually the conjunctiva that is discolored. High bilirubin is divided into two types: conjugated and unconjugated. Whether the bilirubin is conjugated or unconjugated dependson the underlying cause of the jaundice. Pre-hepatic Unconjugated bilirubin most commonly occurs with the breakdown of RBCs and release of heme. This is most often caused by malaria in third world countries as well as thalassemia, Gilbert’s, neonatal jaundice and genetic disorders like Crigler-Najjar syndrome. Bilirubin is not found in the urine because unconjugated bilirubin is not water soluble but there is an increase in urine urobilinogen and serum unconjugated bilirubin. Hepatic Jaundicethat is caused by a process in the liver is most commonly seen in cirrhosis, primary biliary cirrhosis ( impaired excretion of conjugated bilirubin into bile), leptospirosis, drug reactions and hepatitis. This results in both conjugated and unconjugated bilirubin in the blood. The congested bile canaliculi rupture releasing conjugated bilirubin into the lymph and ultimately blood (bypassing the intestine) where it is excreted by the kidney causing the urine to be dark as in our patient. Post Hepatic Jaundice that is caused by a blockage after bilirubin is conjugated is most commonly due to gallstones or pancreatic cancer. In the developing world liver flukes would be a common cause. In complete obstruction of the bile duct, no urobilinogen is found in the urine, since bilirubin has no access to the intestine and cannot be broken down into urobilinogen. Our patient was admitted . the Liver service was consulted the next day and recommended imaging to ro pancreatic cancer. No cancer was found , no eosinophilia was present to suggest DRESS and the patient was discharged. He continued to complain of pruritus but refused further medication that was offered: cholestryramine. Case courtesy of Dr. Aubinwho would like to remind everyone that unnecessary medications can cause problems. deLemos AS, Ghabril M,Rockey DC, Gu J, Barnhart HX, et al. Amoxicillin-Clavulante-Induced Liver Injury. 2016. Dig Dis Sci Aug;61(8):2406-16. Dr. Chase’s Family Physician, farrier, bee-keeper, and second receipt book: Chase publishing company. 1873. P. 452. Hall, JE, Guyton A. 2011 Textbookof Medical Physology, Aunders/Elsevier , p841, ISBN 1416045740. O’Keefe L. Increased vigilance needed to prevent kernicterus in newborns. May 2001. American Academy of Pediatrics. 18(5): 231. Older PostA 66 y.o. farmer presents with an abnormal cxr and no symptoms.